An atlas of the giant asteroid Vesta, created from images taken as NASA’s Dawn mission flew around the object, is now accessible for the public to explore online. The set of maps was created from mosaics of 10,000 images taken by Dawn’s framing cameras at a low altitude of about 210 kilometers. The maps are mostly at a scale about that of regional road-touring maps, where every centimeter of map is equivalent to 2 kilometers. One of the maps is shown above. “Creating the atlas has been a painstaking task — each map sheet of this series has used about 400 images,” said Thomas Roatsch of the Deutsches Zentrum für Luft- und Raumfahrt, Germany, who presented the images September 11 at the European Planetary Science Congress 2013 in London. “The atlas shows how extreme the terrain is on such a small body as Vesta. 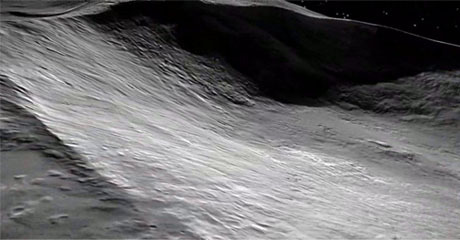 In the south pole projection alone, the Severina crater contours reach a depth of 18 kilometers; just over a hundred kilometers away the mountain peak towers 7 kilometers,” Roatsch said. View the images online at https://dawn.jpl.nasa.gov/multimedia/vesta_atlas_gallery.asp and https://photojournal.jpl.nasa.gov/catalog/pia17480. The Dawn framing cameras were developed and built under the leadership of the Max Planck Institute for Solar System Research in Katlenburg-Lindau, Germany, with significant contributions by DLR German Aerospace Center, Institute of Planetary Research, Berlin, and in coordination with the Institute of Computer and Communication Network Engineering in Braunschweig. The framing camera project is funded by the Max Planck Society, DLR and NASA.